The New Vector R&D LED Turbo is one of the most powerful LED curing lights on the market today! With over 2,100mW/cm2 of curing power this light ranks in the power range and curing time of lights costing double the price. With power like this you can cure up to 3mm in 3 seconds! Why pay over $ 1,000 for a Demetron LE or a Vivadent Blue Phase when similar power is available at such a better value! The LED Turbo emits blue light primarily in the 440 to 490nm range which will polymerize all camphor quinine (CPQ) type materials, which is the most popular type of material on the market and is becoming the industry standard. The compact size, light weight, and ergonomic design as well as large raised switches and buttons, make for easy activation and mode adjustment even when wearing gloves. 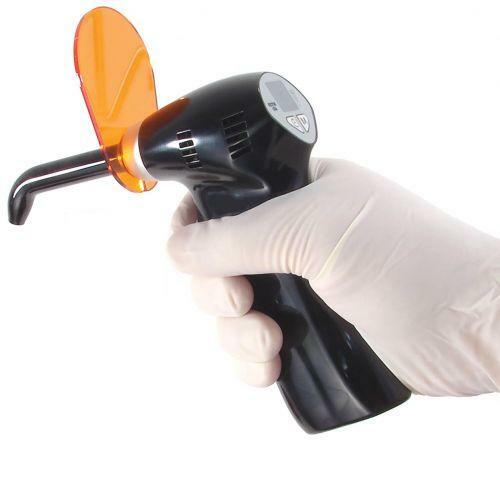 The pistol type gun also allows ideal access to all areas of the oral cavity while balancing out the weight of the battery in the palm of your hand to reduce hand fatigue. The built-in fan keeps the LED assembly cool for longer LED life and better overall performance throughout the life of the curing light. Don’t be fooled by other manufactures that insist a fan is not necessary – for durability, a fan is required. Quick charge, super small foot print charging base. The charging base quickly re-charges the light gun and provides up to 1 hour of curing time on a full charge. That’s a lot of 3 second cures! 5-sec audible tone allows for "hand-free" status communication. The LED Turbo accepts all Vector light guides and is covered by a 1 year warranty (excluding light guides).